Your grand tour of Chicago begins at 108-story Willis (Sears) Tower, the second tallest building in the United States. Zip up to the 103rd floor for exclusive access to the Skydeck, a series of glass-enclosed balconies that protrude from the sides of the sleek skyscraper. You feel as if you're levitating above the city in these small cubes, designed with 15,000-pound (6,803-kg) glass panels and steel rivets. It’s a feeling that attracts thousands of visitors a day. With this Viator VIP, you arrive before normal operating hours to enjoy the coveted views some 1,353 feet (1,353 m) in the air without the crowds. 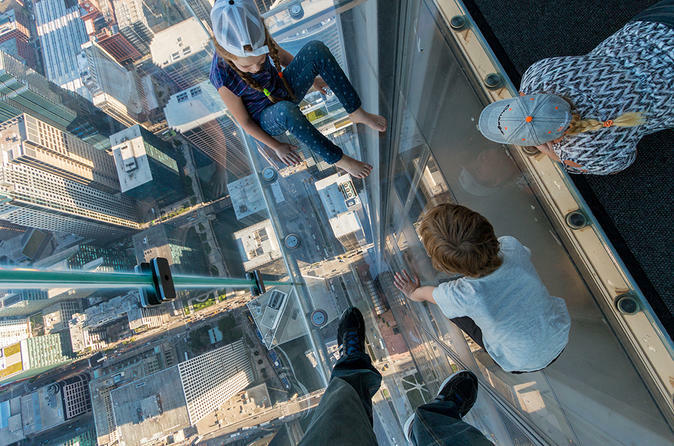 During your visit, snap photos and listen to your included audio tour to learn facts and anecdotes about the city and its most famous sights as you mill around the Skydeck uninterrupted. After an hour at Willis Tower, board a comfortable trolley to begin a 2-hour narrated tour of downtown Chicago. Your insider guide helps you get to know the history and culture of America's third-largest city. See the grand old 1920s-era buildings along La Salle Street in the city's financial district, where you'll make a stop for photos. Continue on your tour, admiring both old and new architectural masterpieces such as the 19th-century Rookery Building, glass-and-steel skyscrapers by Mies Van Der Rohe, the corncob-shaped towers in Marina City, and famous sculptures by Picasso, Calder, Miró and Chagall, among other notable city landmarks. Make a stop at Millennium Park to see Pritzker Pavilion, designed by Frank Gehry, before crossing the double-decker drawbridge over the Chicago River. Drive through the bustling Magnificent Mile area, admiring the John Hancock Center, Tribune Tower and Wrigley Building along the way. Pass Grant Park, Soldier Field and the world-renowned Field Museum of Natural History before a stop at Adler Planetarium. Here you can take a moment to delight in jaw-dropping views of the Chicago skyline from the shores of Lake Michigan. Your trolley tour ends at the popular Navy Pier shopping and amusement area, where you can grab a bite to eat (own expense) and explore on your own for an hour. Then board your 1-hour cruise along the Chicago River narrated by an architecture expert. Learn how architecture flourished in the city after the Great Chicago Fire in 1871, and see more architectural landmarks including the Aon Center, the IBM Building and the distinctive Willis Tower, where you began your tour. Finish your 5.5-hour VIP tour of Chicago in early afternoon at Navy Pier, where you can find plenty of attractions to entertain you for the rest of the day.